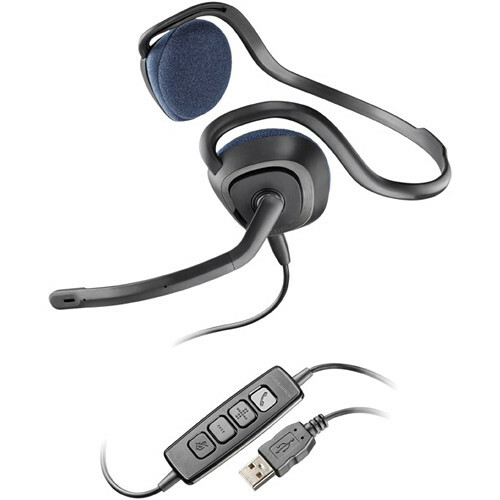 The Plantronics .Audio 648 is a lightweight, stereo USB headset that offers a low-profile design, a noise-cancelling microphone, and built-in digital signal processing that scrubs static and kills echo. The Skype-Certified headset offers inline controls for answering and ending calls, volume up and down, and muting of the microphone. Box Dimensions (LxWxH) 8.3 x 7.2 x 3.2"
.Audio 648 - Stereo USB Headset is rated 3.0 out of 5 by 5. Rated 3 out of 5 by gravitystix from Strange signal processing, but works. I use this to Skype with my girlfriend, she got an identical one. The answer button on the cord doesn't seem to work but that's kinda pointless anyway. The sound quality is infinitely better than our laptop mics can provide. However, when I switch from Skype to Youtube to watch a video together the audio instantly becomes garbled and unintelligible and I'm forced to either reconnect the headphones or quit Youtube or Skype. The headphones aren't very comfortable if worn for longer than an hour. Not sure if it was worth the $ I spent on it, but it gets the job done. Rated 3 out of 5 by VF from Skype Headset Headset is very comfortable on the ears, and the sound is good. I am doing an online language course, and having trouble with the interface when I use the microphone. Rated 2 out of 5 by Sam from Uncomfortable I bought these for work and they rub against my ear and are really uncomfortable. The volume control also doesn't work very well. Rated 3 out of 5 by timothy0515 from Good Technology - Poor Fit The headset controls work well and the audio quality is good. However, they have a loose fit and there's not way to adjust that. Rated 4 out of 5 by Jason from Headsets This product works great, it is the only brand I trust for my customers. I Dnt use an answer to this question.